Join Penthelia Singers for an afternoon of Canadian music, including a selection of music based on Inuit poetry and folk songs. Special guest, Raigelee Alorut, will present a throat singing demonstration as part of the concert. Other music includes works by Srul Irving Glick, Mark Sirett, and Meaghan Smith. Adult tickets are available online, adult and children’s admission also available at the door. 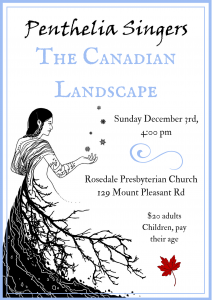 Sunday December 3rd, 4:00pm, Rosedale Presbyterian Church 129 Mount Pleasant Rd. For details, go to Temple Emanuel.